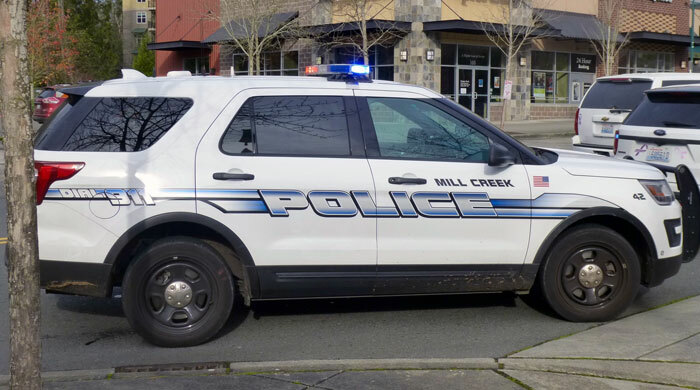 According to the latest Mill Creek Police Blotter, a total of 507 responses were reported the week of March 29 to April 4, 2019. 11:32:49 - 3200 BLK 148TH ST SE: A Mill Creek officer stopped a commercial motor vehicle in the 32th block of 148th ST SE and found the driver had a suspended driver's license. The driver was cited and released on scene. 18:44:04 -14900 BLK 30TH DR SE: Officers responded to a report of a burglary in progress in the 14900 block of 30th DR SE. It was determined the subject was the son of the owner of the residence. 06:45:33 -14100 BLK NORTH CREEK DR: Police responded to a vehicle prowl report in the 14100 block of North Creek Drive, after a Mill Creek man reported that his truck had been broken into and some of his firefighting gear stolen. 07:14:14 -14000 BLK NORTH CREEK DR: Police responded to a vehicle prowl report in the 14000 block of North Creek Drive. The victim's vehicle appeared to have been broken into, but the victim reported nothing stolen. 08:31:29 -15500 BLK MILL CREEK BLVD: Officers responded to the 15500 block of Mill Creek Blvd for a vehicle theft report. A 28 year old Mill Creek man reported his vehicle had been stolen overnight. 09:53:26 -15500 BLK MILL CREEK BLVD: Officers responded to the 15500 block of Mill Creek Blvd for a vehicle prowl report. A 59 year old Mill Creek man reported his vehicle had been prowled and his cell phone had been stolen from within. 15:09:05 -15600 BLK MAIN ST: Officers responded to the 15600 block of Main ST for a theft report. Security alleged a 33 year old Lake Stevens woman stole $26 worth of product from the store. Charges were forwarded in the case. 16:54:18 -16900 BLK 9TH AVE SE: A Mill Creek officer responded to a malicious mischief complaint in the 16900 block of 9th Ave SE. A window to a truck had a rock thrown through it. 11:10:01 - 3200 BLK 132ND ST SE: A Mill Creek officer responded to a report of a vehicle prowl in the 3200 block of 132nd St SE. A suitcase was stolen out of a vehicle. 12:12:48 -14400 BLK NORTH CREEK DR: Officers responded to the 14400 block North Creek Dr for a report of suspicious circumstances. 16:56:37 -15600 BLK MAIN ST: A Mill Creek officer responded to a theft in the 15600 block of Main St. A female was reporting the theft of cash. 03:03:37 -1600 BLK 164TH ST SE: A homeowner in the 1600 block of 164th SE SE reported his unlocked vehicle had been entered unlawfully and the contents of the vehicle had been disturbed. 21:20:36 - 600 BLK 164TH ST SW: A Lynnwood man traveling west in the 600 block of 164 Street SE committed a traffic violation that lead to a stop of his vehicle. The man was found to be under the influence of alcohol and was arrested. 02:10:34 -13500 BLK 35TH AVE SE: Several juveniles were contacted for consuming alcohol near the 13500 block of 35th Ave SE. 10:27:43 - 13100 BLK 35TH AVE SE: An Everett woman was arrested for DWLS 3rd in the 13100 block of 35 AVE SE. 14:35:39 -15600 BLK MAIN ST: A Mill Creek female was arrested for theft in the 15600 block of Main ST. A charge is being forwarded to the prosecutor. 21:19:37 -15600 BLK MAIN ST: An adult male was arrested on an outstanding warrant near the 15600 block of Main Street. 12:06:33 -13300 BLK BOTHELL EVERETT HWY: An Everett woman left her young son unattended in a vehicle while shopping in the 13300 block of SR‐527. A report was taken. 14:31:32 - 2300 BLK 162ND ST SE: A Mill Creek officer responded to a found property incident in the 2300 block of 162nd St SE. A women's wallet was found and taken for safekeeping. 14:38:44 - 2500 BLK 133RD PL SE: A Mill Creek resident in the 2500 block of 133rd PL SE was transported to the hospital for a mental health evaluation after making overtly suicidal and homicidal statements. 20:05:30 - 14700 BLK MAIN ST: Officers responded to the 14700 block of Main St for a welfare check. A 79 year old Mill Creek female was found deceased. 21:19:03 - 1500 BLK 136TH ST SE: An officer responded to a report of graffiti on buildings in the 1500 block of 136th St SE. Nighttime security found multiple buildings spray-painted. Follow-up is required. 22:43:20 - 16300 BLK MILL CREEK BLVD: Officers responded to what was initially reported as a theft in 16300 block of Mill Creek Blvd. Upon arriving, a female was contacted and eventually trespassed from the location and also transported to the hospital by medics. 02:32:08 - 600 BLK 164TH ST SW: Officers stopped two vehicles for racing in the 600 block of 164th St SW. A 22 year old Everett female was arrested and booked into the Snohomish County Jail for Reckless Driving and DUI. Charges for Reckless Driving to be forwarded for a 21 year old Snohomish male. 20:11:37 - 3800 BLK 132ND ST SE: Officers stopped a vehicle in the 3800 block of 132nd St SE for a registration violation. A 37 year old Snohomish female was cited and released for DWLS 3rd Degree and Fail to Surrender Suspended License. 23:35:34 - 13500 BLK NORTH CREEK DR: Officers responded to a malicious mischief report that occurred in the 13500 block of North Creek Dr. A vehicle belonging to a 20 year old Bothell male was damaged by an unknown male. Click on this link to see the March 29th to April 4th, 2019, Mill Creek Police Blotter.